I have been wanting to do a post like this for a long time. I think it would be fun to show you all a look inside some local flower farms around Massachusetts! Lets kick it off with one of my favorite flower farms- Colonial Gardens. I have worked with David, one of the owners, for years and years. And after all this time I finally made a trip to Concord, MA and took a tour of the farm. A little history about Colonial Gardens: David's grandparents owned a greenhouse in Lincoln, MA. In 1950, the National Park service and government came in and took over the land. To keep on the family biz, David's parents purchased the 6 acres of land in 1962 and established Colonial Gardens. To this day, it is a family run farm with 5 greenhouses on the property. Colonial Gardens is the largest full service florist, greenhouse and garden center in Concord. They have a crop growing for every season and are open year round! 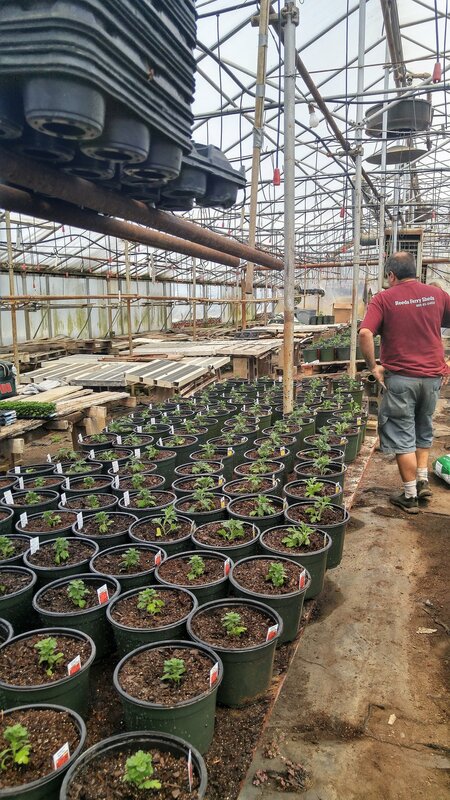 A look inside one of the greenhouses! It's hard to imagine thinking about mums this time of year, but they have already began production on them! They begin growing flowers 4-6 months before the season starts. Below are the first batch of early season mums in production now! Mums become available as early as mid August. Unfortunately, that mum you buy then will not last you the entire fall season. Mum varieties bloom at different times in the fall- early season, mid season and late season through Columbus Day. Your best bet is to pick up your mum plants when it really starts to feel like fall outside, mid to late season. Another fun fact is that mums aren't technically a perennial! Although you probably have some in your yard that come back every year, they are cross bred so much (which is why there is an abundance of every single fall shade) that they don't have the strongest genetics to winter over. Keep that in mind when planting your mums this fall. There are the OG varieties of garden mums that are guaranteed to survive our winters and come back every year, but there aren't as many color choices for those. A new item they began growing this year are the Sunfinity sunflower plants. These babies are tall, have lots of buds ready to flower, and get this- they will provide you with up to 50 FLOWERS! Unlike your regular sunflower plant that blooms and then its done, these keep re-blooming all season long. How cool is that?! Blanket flower as far as the eye can see! 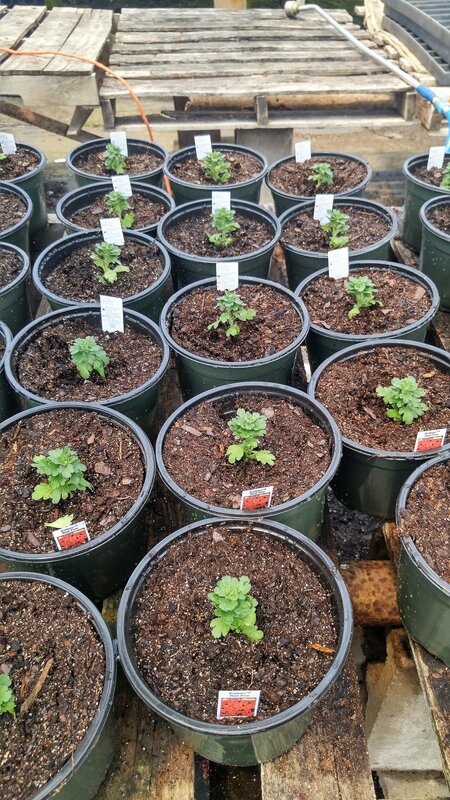 Perennial hibiscus will be ready in another three weeks. You might wonder what they have in the winter time. Colonial grows cyclamen and poinsettias and sells Christmas greens and boxwood trees. Christmas eve until January 10 is the only time they don't have anything in production. After that they get started on spring flowering plants. I learned a lot from my first field trip! If you are ever in the area, make sure to check them out at 442 Fitchburg Turnpike in Concord. They have a retail shop with a huge selection of indoor and outdoor plants, garden supplies and containers. There is also a florist here too- providing fresh flower arrangements and services for weddings and events! You can find their sensational plants at farm stands in the area and at your local Whole Foods Market! Thank you to David and all of my friends at Colonial Gardens for taking the time to show me around! I hope you all have a fun and safe Fourth of July weekend! Take a moment to stop and smell the flowers and live your best life.